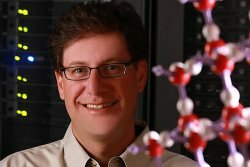 Congratulations to Dr. Chris Mundy, Pacific Northwest National Laboratory, on being invited to give a plenary talk at the American Conference on Theoretical Chemistry, July 2011. This conference, held every three years, features innovative ideas and new research. The event, which grew from a Gordon research conference, is widely attended by chemists from the United States and abroad. In his plenary talk, Mundy will discuss the benefits and pitfalls of using density functional theory to understand the behavior of charged particles in water and at the air/water interface. Mundy was chosen to give this talk based on his work in equilibrium and non-equilibrium statistical mechanics. He is also known for his work in ab initio and classical molecular dynamics development and applications. In addition, he leads large-scale simulations on leadership-class computers through a Department of Energy INCITE award. "It feels good to be recognized by your peers—to be chosen to give a plenary lecture at the ACTC. It is quite an honor," said Mundy.